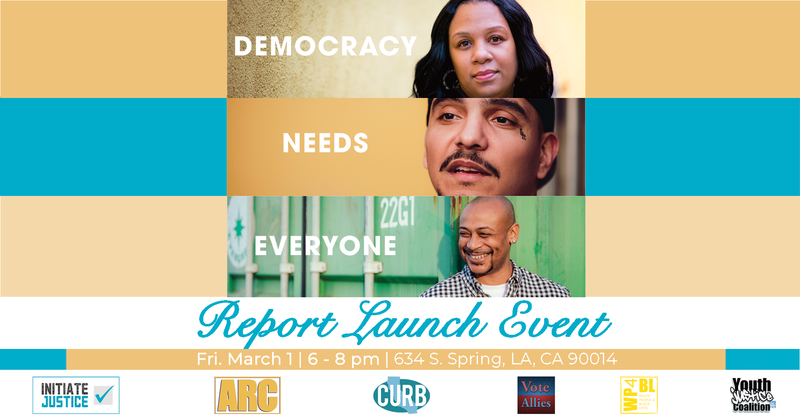 Initiate Justice would like to invite you to our “Democracy Needs Everyone” Report Launch Event! “Democracy Needs Everyone” is a first-of-its-kind report unveiling our groundbreaking research on the importance of restoring the right to vote to people in prison and on parole. We surveyed more than 1,000 incarcerated people and people on parole in California with the goal of uncovering how our political system could improve by ending felony disenfranchisement. Our data reveals: 1) People in prison and on parole are interested in voting and would be active participants in our democracy; 2) People in prison and on parole contribute to their communities in various positive ways; and 3) Restoring the right to vote to people in prison and on parole would improve public safety. Come out and engage with the report authors, hear from survey respondents, and learn about our key findings. You can also learn how to support the Free the Vote Act, an Assembly Constitutional Amendment that would place an initiative on the 2020 ballot to restore voting rights to people on parole! Light dinner will be served and copies of the report will be available.